3 Point Antler Restriction in Vermont - What Would Happen? - the4pointer.com | Real Hunts. Unreal Stories. 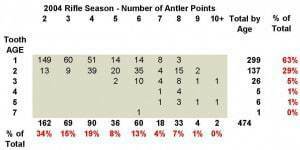 3 Point Antler Restriction in Vermont – What Would Happen? 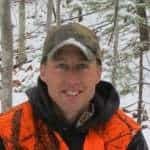 After months of studying the numbers I’ve finally decided to write about my conclusions of what would happen if a 3 point per side antler restriction (AR) was implemented in Vermont. My wife is tired of me always sitting with my notebook full of notes and a calculator while we watch TV and talking about it in my sleep. She cares not what percentage of the buck population actually carries 3 or more points on a side no matter how many times I tell her. Keep in mind that these are my own opinions and are not affiliated with anyone else or any organization. The reality is that determining the number of legal bucks under a new regulation, such as higher antler restrictions, is complicated and there are a ton a variables such as winter severity, predation, poaching, disease, hunter wounded deer, etc. that can widely affect the outcome of my study. However, I’m dumb enough to give it a shot, so here it goes…you can decided for yourself if my overview is worth anything. If a 3 pt AR had been implemented in 2014 what would the harvest have looked like? How long would it take to restore current harvest levels? More importantly, could they be restored? I must say that I was hoping to take the 10,000 foot approach in this study to just gain a general overview of what would happen. I ended up getting bogged down in the numbers and realized there are arguments that can be made for and against every conclusion I came to. In the end, I had to make certain assumptions and just go with them or else I would never conclude anything. To that end, I fully admit that I am not an expert – as I said in the first paragraph I did most of this in my spare time and while I was asleep. In an effort to keep this simple I decided to use averages as a means to predict outcomes. Obviously, each year there is a unique set of variables that can dramatically change a harvest but I chose not to get that detailed. In order to establish the percentage of legal bucks available pre-hunt I used data collected by biologists during the 2004 Rifle Season (Before the Spike Rule) and a compilation of data from youth seasons 2008-2013, along with my own estimates of the age structure. I used 7,718 as the average buck kill by archery hunters, rifle hunters, and muzzleloader hunters (because that’s what it is) from 2008-2014 in order to compare the first year harvest under a 3 pt AR. I did not include youth season harvest numbers in the average. The estimated deer population during that time ranged from 141,000 at its highest to 112,000 at its lowest. In 2014 it was estimated to be 135,000. Much of my information was compiled from past harvest reports which you can find on the Vermont Fish and Wildlife website. I also assumed a harvest rate of legal bucks to be 62% statewide which is the average from 2000-2007 as recorded in the Vermont Big Game Management Plan 2010 – 2020 on page 25. Some years the rate is estimated to be much lower and other years it has been estimated to be much higher. I am using the average. Let’s take a look at my first question. 1. If a 3 pt AR had been implemented in 2014 what would the harvest have looked like? 5,400 x 62% harvest rate = 3,348 or a 57% reduction from the recent harvest average of 7,718. Second, I used the data from the 2004 Rifle season which shows that 68% of the bucks would be ineligible for harvest. 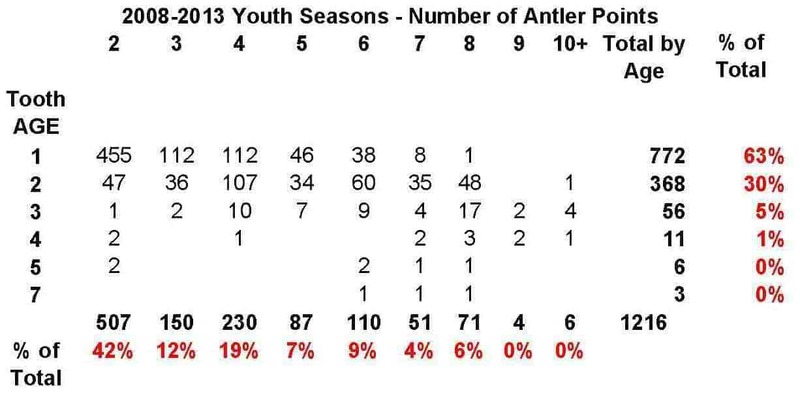 That data is over 10 years old now but many people argue the data collected during youth is not as reliable because of the small sample size and because youth hunters are believed to be less skilled, so therefore they kill a larger percentage of younger deer. For example, the youth data shows that 25% of bucks 4 years and older carry fewer than 5 points but only 20 deer were sampled. The 2004 data was 0% with a sample size of 12. So, just for kicks I ran the same math problem with 68% instead. Third, and arguably the most accurate approach, I tried to breakdown the number of legal bucks by age, but in order to do that I needed to know the age structure of the buck population which is difficult to pin down. For example, in the chart above it shows that 63% of the youth harvest is made up of yearling bucks (so was the ’04 Rifle harvest) but that may not be actual percent of yearlings in the population because yearlings are easier to kill so by default they will make up a higher percentage of the harvest. As a result, it’s not as easy as saying that 63% of 20,000 bucks are yearlings. However, I do feel that the data does give a good representation of the number of points per buck in each age class. 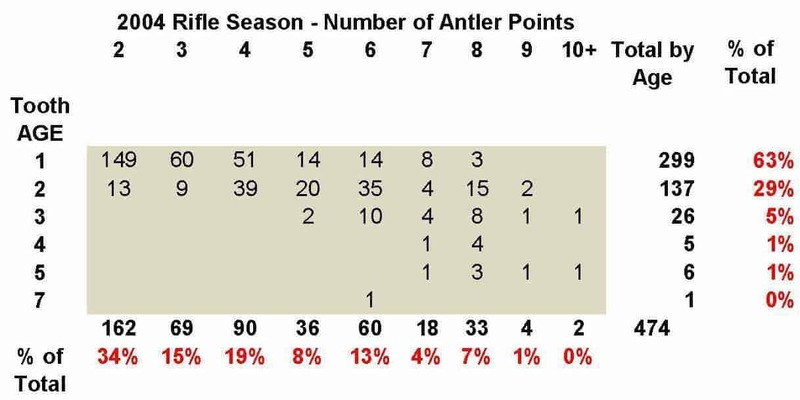 As seen in the chart, 772 yearling bucks were inspected and 679 of them had four points or less which equals 88%. That percentage would probably be the same whether yearling bucks make up 63% of the buck population or 52% of the population, but not knowing what percentage of yearlings make up the buck population can result in much different predictions of harvest numbers so I am hesitant to state my results. Of course, in the beginning of this article I told you I was dumb so I’ll tell you anyway. I came up with a harvest of 4,287 which is a 44.5% reduction from the average and the highest of the three scenarios. This was based on 52% of the population as yearlings, 36% as 2 year old, and the remaining bucks as 3 years old and older. This resulted in a higher number of legal bucks in the overall population ( 6,915) compared to the first two scenarios and thus resulted in a higher harvest estimate. If I am wrong (it wouldn’t be the first time and won’t be the last) and the yearling percentage is higher, the harvest estimate would go down. If it was lower, the opposite would be true. To summarize, I determined that with the buck population estimated to be 20,000 and a hunter harvest rate of legal bucks at 62%, the harvest would have been between 3,348 and 4,287 bucks (44.5% to 57% reduction) in 2014. 2. How long would it take to restore current harvest levels? Or better yet, could they be restored? Tackling this question proved to be extremely complex and after months of studying I am not confident enough to provide actual numbers because there are too many variables that cannot be predicted and there is a lot I do not know. However, my general conclusion is that the buck harvest will not be restored to current harvest levels. Generally speaking, doe reduction strategies are put in place when more bucks are protected by antler restrictions because the land can only support a certain number of deer (determined to be 140,000 deer in Vermont). If the buck population grows to level that would cause the overall deer population to exceed that limit then the doe population must decrease. Since does in Vermont already have high recruitment rates (1.51 fawns per doe during 2000-2008 – see Big Game Management Plan pg 10, Table 2.1) it seems logical to think that there will be fewer male fawns recruited into the herd which won’t help the buck population grow. Of course, if the habitat was improved the land could support more deer and fewer does would have to be removed. Those that support an increased AR typically refer to Pennsylvania as a success story. An interesting fact about PA is that even with a 3 pt AR in place, 55% of the buck harvest is still made up of yearlings, which means that a lot of yearlings have 3 points or more! 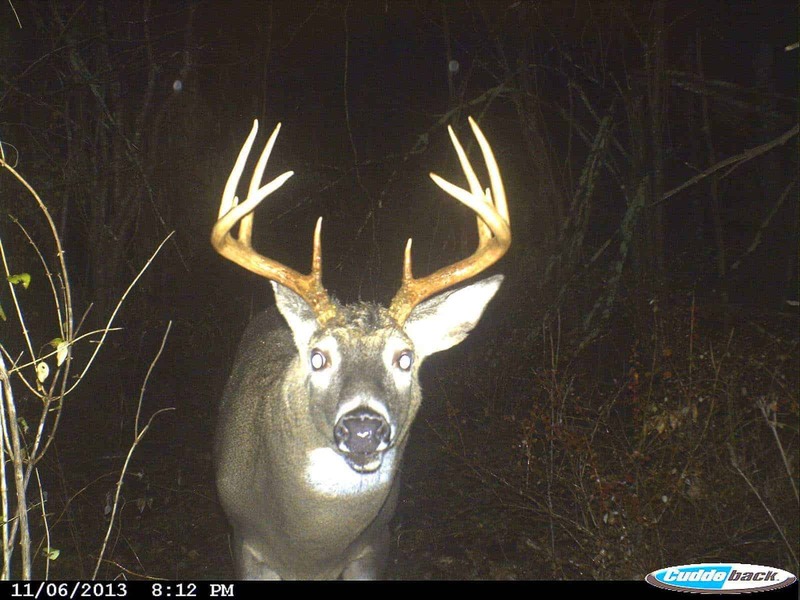 This allowed the harvest to rebound more quickly than I believe it will in Vermont because based on the charts above, only 12%-13% of yearling Vermont bucks have at least that many points on a side (the percent of harvest might be closer to 20%). On the positive side this means that the vast majority of yearlings will be protected, but I don’t think VT’s harvest numbers would be able to climb back up to the current average similar to the way it has in PA….unless the habitat was improved to support a larger deer herd. To summarize, I do not think that the buck population can grow to a point that would support current harvest levels unless the habitat is improved so that the land can support more deer. The purpose of my study was to objectively determine what would happen to the buck harvest should a higher AR be implemented in Vermont. I believe I have a decent understanding of that now. On the flip side, the purpose of my study was not to determine whether or not a higher AR is worth it. That is a different discussion altogether. The truth is that under a 3 pt AR there will be more mature bucks harvested than before. That will happen by default because they will be the only legal ones to shoot – just as we saw when the spike rule was put in place. And, the buck population will grow as a result because more bucks will be protected at a younger age. 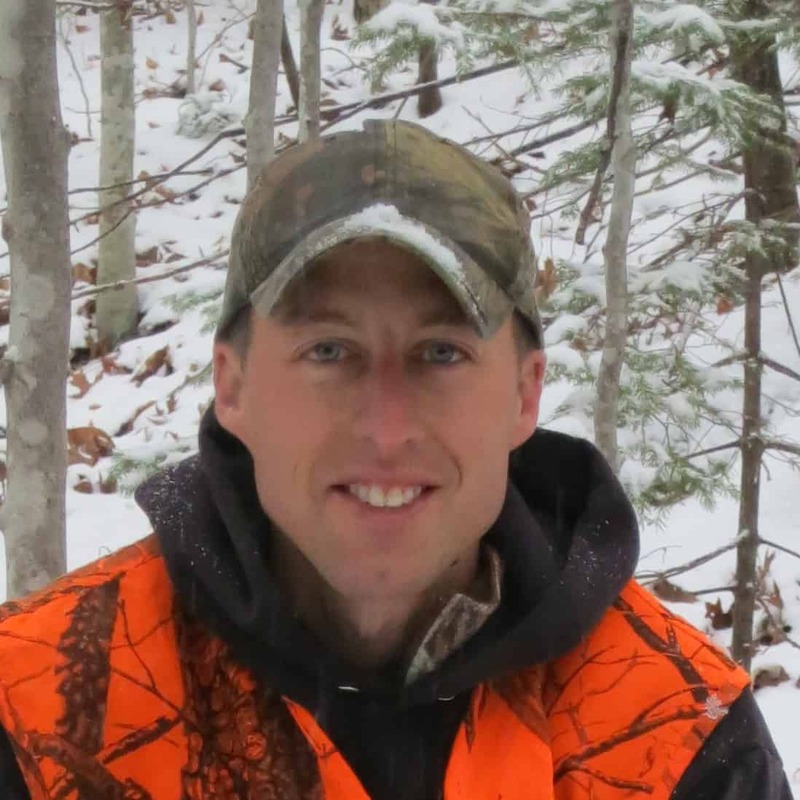 That does not mean that hunters in Vermont will kill as many bucks as before – the majority of bucks in Vermont appear to carry a small amount of points which is a substantial hurdle to overcome if hunters are hoping to see harvest numbers they are used to seeing in the past. The proponents of an increase will have to convince their opposition that seeing more bucks (even if they are not legal), more rutting activity, more buck sign and many other benefits is worth the trade off of shooting fewer bucks – at least until the habitat can be improved to support more deer. That’s the way I see it anyway. Well, that’s it for now. Thanks again for reading and I look forward to all the discussion! If you would like to subscribe you can do that by clicking on this link: Subscribe Or, you can like The 4 Pointer on Facebook.